Carillion, the mammoth construction and outsourcing company headquartered in England, had about 43,000 employees spread across the U.K., the Middle East and Canada. Who is going to plow the snow from the highways in the Huntsville corridor? That’s a question far removed from Westminster, where Prime Minister Theresa May faces calls for a full and speedy investigation into the liquidation of Carillion, the mammoth construction and outsourcing company, headquartered in Wolverhampton, with about 43,000 employees spread across the U.K., the Middle East and Canada. According to Carillion Canada Inc.’s website, 40,000 kilometres equates to “the largest outsourced volume of roadways in the nation.” That’s a lot of salt. This is the same company that launched its Toronto operations in 1955 as George Wimpey Canada Ltd. Home buyers in the 1970s particularly will recall the name. A corporate history recounts how the British firm capitalized on Toronto’s desperate need for housing construction, attesting that by 1970, “Wimpey was building nearly 2,000 homes each year in the province of Ontario alone.” Crispy press clippings recount stories of hundreds of eager house buyers lining up for pre-build sales at subdivisions where detached homes sold for between $40,000 and $50,000. 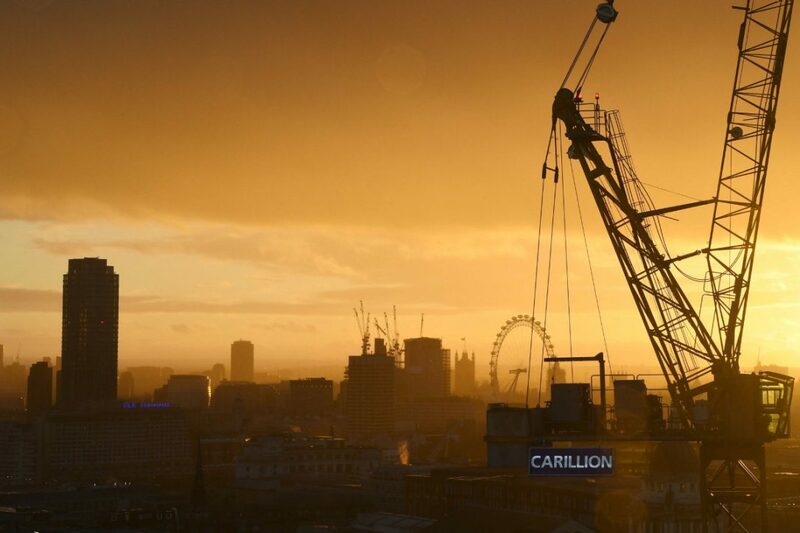 The name Carillion emerged as the successor support and construction services provider, and it became a monster, benefitting spectacularly from the now decades-long trend of outsourcing private sector contracts and being in the right place at the right time for enormous public-private partnership (P3) construction projects. Those P3s here at home included the Oakville Trafalgar Memorial Hospital as well as design-build work at both the Centre for Addiction and Mental Health and Sunnybrook Health Sciences Centre. Public sector outsourcing is a key part of the puzzle. According to the Guardian, Christopher Grayling, the U.K.’s secretary of state for transport, awarded nearly £2-billion worth of contracts to Carillion plc, even after it first issued profit warnings. Little wonder that the Labour party is accusing the government of “drip-feeding” contracts to Carillion to help keep it afloat. Last July, Carillion launched a full strategic review of all operations. A hoped-for sale of its Canadian subsidiary was deemed essential to the financial fix. Instead, underperforming P3 contracts and an estimated net debt of between ₤825 million and ₤850 million dominated the company’s financial update to investors in September. The numbers only grew worse. Carillion Canada did not respond to requests for comment, but a spokesperson indicated to The Canadian Press that the Canadian operations would carry on as per usual. Let’s look at some smaller numbers. September brought the announcement from Ontario’s Ministry of Transportation that its maintenance contract with Carillion Canada would be brought to a premature halt. That contract, which commenced in 2012, was for provincial highway maintenance covering the Highway 400 corridor (Port Severn to Pointe au Baril) and Highway 11 to Haliburton and Minden. The contract was to extend until the spring of 2023. Carillion said it would continue the job until September 2018. Now what? Who knows? The ministry awarded the new contract to Fowler Construction Co. to commence next fall. At the time of the cancellation announcement, a ministry spokesperson was quoted saying the re-tendering would allow the ministry to make “enhancements” to the services provided. Huntsville residents will be interested in this for they will likely recall the $80,000 fine levied against Carillion Canada two years ago for contravening the Environmental Protection Act by burying drums of petroleum and paint waste in its Huntsville yard. As for road clearing, calls for better service are not new. In 2015, Carillion was fined $900,000 for failing to adequately clear and sand the QEW between Burlington and Mississauga in November and December of the previous year. In that instance, Carillion fought the fine. Successfully? I don’t know. The Ministry of Transportation cites confidentiality in the ensuing mediation, which, the ministry reports, was resolved. I do know that the Ontario road maintenance contracts awarded to Carillion, eight in all, were valued at $87 million. There are far bigger stories unfolding in the wake of Carillion’s collapse, including at-risk overseas construction projects running into the hundreds of millions of dollars. And escaping executives making out like bandits. But it’s a broad cautionary tale to take a harder look at the outsourcing of essential services, not to mention the global Kool-Aid we’ve been drinking when it comes to P3 alliances.